Why have immersion programs at the preschool level? Research has shown that young children have a unique ability to absorb a foreign language naturally. Experts estimate that by age 8-12, humans already lose the ability to hear and say new sounds. Young brains are hard wired to acquire language. Taking advantage of the window of opportunity that exist between birth and adolescence allows a child to optimize his or her learning potential, and speak the second language with a native accent. In addition, studies show that young children who learn a second language enjoy many additional cognitive benefits, such as enhanced problem-solving skills, enhanced spatial relation skills, and heightened creativity. When children enjoy their environment and feel safe, they absorb their surroundings and learn without even realizing it. Is there any English spoken in the class? The class is complete immersion, which means no English will be spoken except in emergency situations. Communication with parents will generally be in English. Once the children enter the classroom, they are immersed in (surrounded by) the Spanish language. How will my child understand what is going on in class? Young children learning a second language will learn Spanish the same way they learned their first language. The teacher will use hand and body cues, stories, inflection, facial signals, songs, games, and fun to make clear what is being conveyed. This way of teaching is known as Total Physical Response (TPR), and it is very successful in communicating in situations where the language is not understood. Children learn to explore and examine their surroundings and environment. In a short time, they catch on to what is being communicate. Young children do not have the same inhibitions that older people tend to have while learning. They are natural mimics and have little fear in making mistakes; they absorb the second language much more naturally and without hesitation than an older child or adult might. Do we, as parents, need to know how to speak Spanish? It is not necessary that parents speak Spanish. The teachers instruct your child with proper pronunciation, grammar, and accent. Of course, having reinforcement at home is always an advantage, but children with little or no reinforcement of Spanish at home are just as successful in immersion programs as those with native speakers at home. Parents often enjoy learning Spanish at the same time as their children. Most parents observe that the younger students quickly surpass adults in their learning curve. How much Spanish will my child retain/remember? It is difficult to quantify exactly how much a child will retain since each child is unique in his/her language development. However, studies have shown that exposure to foreign language at a young age aids in learning a second or third language at adolescence and adulthood. The familiarity with the Spanish language will also help them to "pick it up again" at a later age. Studies have shown that learning a foreign language adds additional cognitive benefits some of which include: enhanced problem-solving skills, enhanced spatial relation skills and heightened creativity. What age is the best to introduce a child to a second language? Does a second language interfere with a child's English ability? In most of the cases, learning another language enhances a child's English ability. Comparing and using two language systems is helpful to children's understanding and use of each. Reports have demonstrated that children who have learned a second language earn higher SAT scores. Is it harder for a child to acquire two languages at once? There is no evidence to suggest this. A child doesn't have to be exceptional to become bilingual; as long as the child is exposed to two languages throughout early childhood, he or she will acquire them both. Additional activities at home are not required for a child to successfully learn a second language. We can, however, advise you in this regard if you wish to enhance your child's language acquisition and experiences at home. Will my child have a hard time when introduced to a school program in English? No. Studies show that exposure to a second language at an early age, enhances the part of the brain that processes language. Therefore, children are able to understand the intricate nuances of language more quickly than non-bilingual students. Yes. 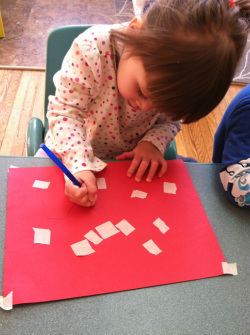 We follow play-based preschool curriculum based on the research of the high/scope foundation. Our primary goals for children, aside from acquiring or reinforcing Spanish language, focus on social and emotional skills: self-regulation, decision-making, social participation, appropriate problem solving, making observations and hypotheses, making and following democratic rules, following teacher rules, and participation in a daily routine. In addition, teachers intentionally plan hands-on learning experiences that build pre-academic foundations in math, science, literacy, social studies, and the arts. Children exiting our program and entering kindergarten are well-equipped for kindergarten curriculum. Where can I find enrollment information? The current tuition scale and enrollment information can be found here. Please email us at manzanitas@appleplayschools.org or call 734-975-9104 if you would like to schedule a tour or find more information!